Laughing gas addiction and abuse are on the rise. This is due to more and more people turning to cheap and easily accessible methods of getting high. Previously, laughing gas has been viewed as a pretty harmless substance and it used to be classed as a legal high. But due to a recent sharp rise in related deaths and hospital admissions, it is now a controlled substance in the UK. More have died in the past year from its effects, than ever before. Laughing gas has always been a drug of choice for teenagers, going through an experimental phase. It is mainly used recreationally. Now there is a darker side to this ex-legal high. Its reclassification under the Psychoactive Substance Misuse Act 2016 has raised awareness of its presence through media, and it now appeals to a much larger age group of the general population. It is possible to become psychologically addicted to its effects. This can result in devastating and debilitating damage to the brain and body. Laughing gas has been deliberately inhaled and abused for the purpose of getting high since the early 1800’s, but not to the extent that it is now. In this article, we will tell you the facts about this toxic gas, including what it is, its effects, its addiction potential, the dangers associated with the drug, and how you can get help for yourself or a loved one with a problem. Laughing gas is a common name used for nitrous oxide, which is a gas for medicinal and industrial purposes. It is not intended for human recreational use. Other common names for nitrous oxide include Nitrous, Sweet Gas and, more recently, Hippy Crack. It is most popularly referred to as laughing gas, due to one of the main effects that users seek is the euphoria and fits of the giggles it produces when inhaled. Nitrous oxide has two main legitimate purposes, the first being for industrial use. It is sealed in metal canisters to aerate and propel the contents out, such as whipped cream. It is also used to seal in packaged meats to help maintain freshness for longer. Another industrial use is to boost performance for internal combustion engines in racing cars. Some modified cars have nitrous oxide boosters fitted with canisters of the gas on board to make them go faster, burning fuel at a higher rate. These cars are only legally modified for some classes of auto racing. They are very difficult to insure for everyday purposes due to the potential hazard that they pose on the roads. If you are using nitrous oxide to boost your car’s performance, it is important to get the engine professionally fitted and regularly checked for any leakage of gas. This could prove extremely dangerous if you were to inhale the gas whilst driving your car. The other legitimate purpose for nitrous oxide is for its medicinal properties in clinical environments. Medically, it is commonly used for pain relief and relaxation, during procedures such as dentistry, quick medical procedures that do not require sedation or that need the patient to be conscious during the procedure, as well as during labour. When used as a medicine under medically controlled delivery, it is perfectly safe. Its effects decrease brain activity and awareness of surroundings and events at the time, providing light anaesthesia and pain reducing effects. The dosage can be adjusted according to how the individual is responding to it, or taken away altogether if they have an adverse reaction. When used recreationally, it is rarely inhaled in a controlled way and is used purely for the effect of getting high. Taking in too much of this gas, which is classed as a volatile substance, can result in dizziness, vomiting and fainting from the brain being starved of oxygen. These effects are common, but there are also some very dangerous and serious effects that every recreational user or abuser should be made aware of. If you or a loved one are using Laughing gas recreationally, it is important that you are aware of the associated dangers, in order that you can take every precaution to ensure personal safety; even then, there is no guarantee that something won’t go wrong. This could result in devastating consequences. It is always best to seek help and advice from an addiction professional if you feel that you or a loved one have a problem with the abuse of this gas. Please do not hesitate to contact us for confidential and professional advice. Laughing gas is very dangerous when abused and is classed as a volatile substance. It has powerful psychoactive and unpredictable effects. Abusing it over long periods of time can lead to all kinds of physical, neurological and mental health problems. These effects can be lasting and very difficult to treat adequately. Basically, once neurological damage has been caused, the recovery period is long, and in some cases the damage is irreversible. Neurological damage results from vitamin B deficiency, caused by the body and brain treating the substance as a dangerous toxin and reacting to it, depleting the body of this crucial vitamin. Vitamin B12 deficiency also causes anaemia, and those that abuse the substance frequently or heavily are far more likely to suffer from this effect. Despite no evidence of laughing gas being physically addictive, it is entirely possible for an addiction to develop psychologically. Having an addiction through repeated and frequent use is extremely dangerous; it is vital that if this applies to you or someone that you know, that immediate professional help is sought. Sadly, in 2016, laughing gas was linked to eight deaths in England and Wales. This is a further increase from previous years. The gas is responsible for more deaths in the past 4 years together than the previous 20 years combined. These statistics were verified by the Office of National Statistics (ONS). Death from Laughing gas results from over inhalation, usually by long-term chronic users; who over time resort to inhaling more, in order to gain the original effects. Those that are new to using the drug are also at great risk, as they may not aware of the associated dangers, and so proceed to inhale without caution. Over-inhalation of Nitrous Oxide causes asphyxiation (suffocation due to lack of oxygen). It can also cause cardiac arrhythmia and cardiac arrest, another cause of death that can result from using this gas. The collective evidence points to a sharp rise in the use of laughing gas over the past few years, resulting in more deaths in 2016 since official records began. One of its main appeals is that it is short acting; so if you are abusing it, you can still continue with your everyday life once the effects have worn off. This may make it seem like an ideal and safe way of getting high, but the reality is that it’s not and it has taken many young lives, well before their time. The dangers of Nitrous oxide inhalation are real, and the recent increase in deaths can only be attributed to its increasing acceptance and availability, together with the law failing to enforce its new illegal status, thus providing less protection from harm. If you are addicted, however, this is an entirely different matter; you will find that the substance slowly takes over your life to the point of incapacitating you from responsibility and isolating you from the ones you love most. Ultimately, it could cost you your life in more ways than one. 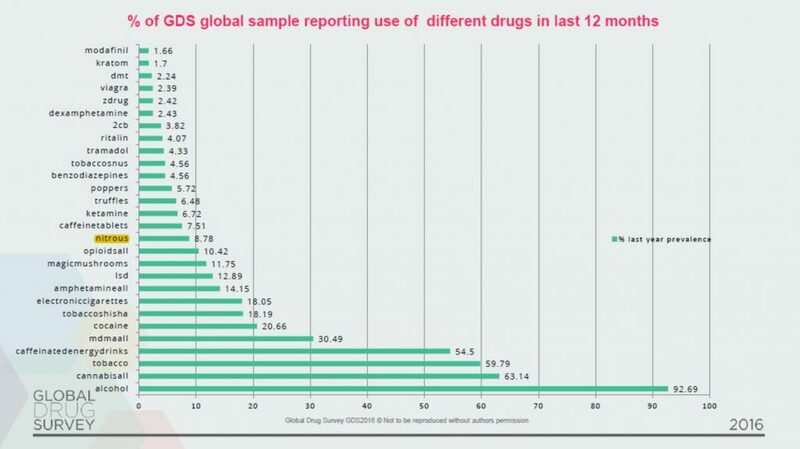 The Global Drug Survey for 2016, shows that Nitrous Oxide has become more prevalent in its use than many prescribed medications that are commonly abused, even benzodiazepines, which are notorious for being dangerously addictive. It is important to recognise, that laughing gas can be extremely dangerous when abused. It can have devastating and long-lasting effects, changing your life indefinitely. As a toxin to the body, it should only be inhaled under medical supervision. If you are worried about you, or someone you care for, using this gas, please do seek advice. Getting help soon rather than later could be life-saving. We understand that you may feel embarrassed or ashamed to admit that you have a problem; we are very considerate of this, as we are passionate about helping those who are suffering from an addiction. Our telephone lines are staffed by friendly, fully trained, addiction experts, who will make every effort to help you access the treatment and support you need to get well and recover. Up until the Psychoactive Substances Act, 2016 was brought into effect, under the Substance Misuse Act 1971, laughing gas was legal for all purposes, including recreational use. However, despite its obvious dangers when abused, and its reclassification and illegal status for recreational use, court cases for prosecution of supplying the gas have fallen through. Rendering its reclassification useless. The failing in law enforcement is due to a legal loophole in the Psychoactive Substance Misuse Act, which makes drugs that are used for medicinal purposes exempt – even when they are clearly being used for purposes other than legitimate medication. The fact that court cases against suppliers and sellers of Nitrous Oxide for recreational use are falling through, causes widespread concern for users of this substance throughout the UK. Sadly, the media attention it has attracted has given sellers the awareness around what the law can and can’t enforce. This has resulted in laughing gas becoming more popular than ever and being sold openly on the streets to the general public. In September 2017, The Guardian newspaper printed an article entitled “The laughing gas verdicts represent a failure of Britain’s drug policy”, in reference to the many failures of successful prosecution at courts throughout the UK for intent to supply for recreational use. Due to various court cases collapsing, the law on laughing gas is now under review; as when abused for recreational purposes, it’s dangers are evident. Driving whilst intoxicated with the effects of laughing gas is also illegal and carries the same penalties as drink driving. Laughing gas can seriously affect your judgement, perception and decision making. There have been incidents of groups of individuals driving cars in a dangerous manner, whilst inhaling the gas. This is something the law would not take lightly if prosecuted, for obvious reasons. Driving under the influence of Nitrous Oxide can be lethal and cause the deaths of other innocent individuals. How Is Laughing Gas Used Recreationally? Laughing gas (Nitrous Oxide) is used recreationally for the purpose of getting high and is now commonly used at parties and festivals. In particular, it is popular with the younger generation – teens to late 20’s. The gas is purchased in canisters which are then used to fill balloons. The individual using the gas, then slowly inhales a breath from the balloon in order to feel its effects, which are more or less instant. Laughing gas has been abused recreationally for many years, this is nothing new. However, it has recently become more prevalent in its use again. This has raised a widespread public health concern, due to a sharp spike in hospital admissions and individuals actually dying from taking in too much gas. It would seem that its use for recreational purpose is at an all-time peak, sadly resulting in much suffering and even death. Laughing gas more recently earned the nickname of “hippy crack”, due to its short sharp high and its popularity at festivals. It now has a far wider appeal than just to a festival or party goers – it is cheap and easy to buy. Individuals are seeing it as an alternative to alcohol or other drugs; it is openly sold on strips that are lined with popular pubs and clubs attended by the younger generation. This is the first time that laughing gas has seen to be used on this kind of level, and an indication of its growing popularity and acceptance in the UK. If you are thinking of trying laughing gas for the first time, we would advise you learn of the associated dangers before taking that risk. Laughing gas may seem harmless, but when abused it is a very unpredictable drug. There have been cases cited for it causing long-term irreversible brain and nerve damage, comas and even death. It is not uncommon for individuals to pass out from lack of oxygen to the brain, or engage in risk-taking behaviour whilst under the influence of its effects. This makes you vulnerable to accidents or doing something that you may later come to regret. The effects of laughing gas, when inhaled, produce a short but powerful feeling of euphoria, lightheadedness and the giggles -.these are the sought after effects by recreational users. They can generally last anything from 30 seconds to a couple of minutes. Unwanted and adverse effects of this drug can include hallucinations, detachment from reality, unsteadiness, muscle weakness, loss of balance, seizures, fainting, cardiac arrhythmia, heart attack, coma and even death. With each inhalation, you are putting your life at more risk. The more you inhale, the more you are likely to suffer from the unwanted and dangerous effects associated with this drug. If you are worried that you are using this gas too often and are unable to stop, you may have an addition. This being the case, we would advise you to seek professional help as quickly as possible. There have been many cases recorded of individuals who have been addicted to abusing the gas, being severely affected to the point of having irreversible damage. One such case, that caught the media’s attention, was a female university student from Sydney, Australia, who was inhaling 360 canisters of Nitrous Oxide a week. This left her with permanent damage to her spinal cord and unable to walk. The unnamed young woman is now in hospital rehabilitating and learning how to walk again, but sadly there is no guarantee that she will regain full mobility of her legs. The university students plight was detailed in an article ran by The Daily Mail newspaper in September 2017, warning of the dangers of laughing gas when abused. Toxicologist Dr Andrew Dawson told ABC news, that there were a growing number of hospital admissions relating to Nitrous Oxide abuse, and that more and more youngsters were turning to the cheap and easily accessible drug to get high. Long-term damage usually results from chronic and long-term use. If this applies to you, there is an effective treatment available to help you stop. Please call us or use our LIVE CHAT to find out more about your local treatment options. It is quite rare for an individual to be recognised as addicted to laughing gas, although its abuse is very common and addiction to it is on the increase as a result. The reason it is rarely recognised is that it is so short acting and not proven to be physically addictive. This does not mean that someone cannot become psychologically addicted to the euphoric high that it produces, and abuse it to the point of long-lasting binges and frequent daily use. Laughing gas is much the same as many other substances or toxic inhalants, in that you can build a tolerance to it. This means that over time you are likely to use more and more in order to gain the desired effect. This is where abuse can become an addiction and a very dangerous one at that. 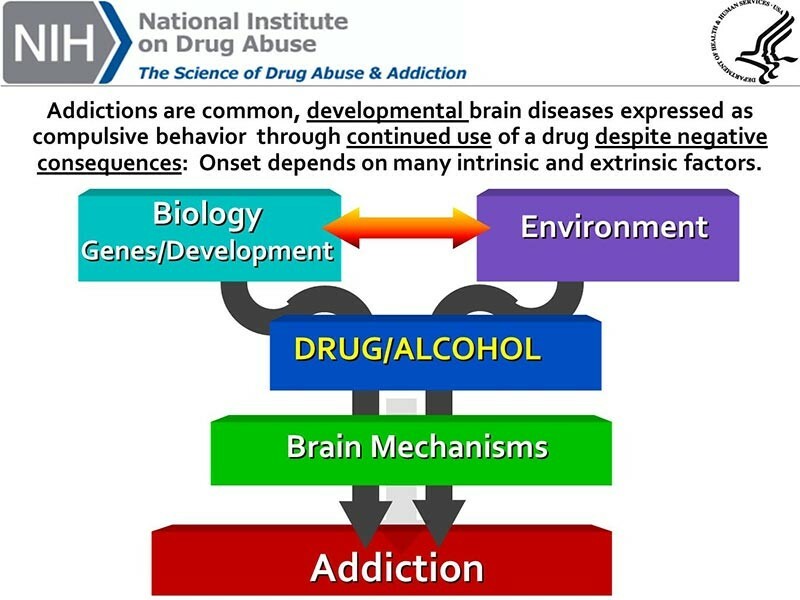 Over time, chemical changes will take place in the brain that will hardwire a frequent user of any substance to compulsively use; even when they want to stop they will find they cannot. It will feel much like a physical addiction, with the same craving and compulsion for the drug, regardless of negative and harmful consequences. Volatile substances, such as laughing gas, can not only be addictive but they are also often a gateway to other more obviously harmful drugs; especially when experimentation and abuse start during childhood or teenage years. This is when the brain is still developing and at its most vulnerable to change. Addiction Helper is receiving more calls from concerned parents regarding their teenagers abusing laughing gas, especially parents of students. If you are a parent of a teenager, we feel it is important to arm yourself with the facts of all drugs and ensure that your child is made fully aware of the associated dangers. More often than not, teenagers will experiment with what they see as less harmful drugs, i.e alcohol, cannabis, prescription drugs and volatile substances. To a young and developing brain, all drugs are harmful and could potentially lead to progression to regular abuse and addiction. If you need advice on how to speak to your child or teenager about their drug use, please call us so we can assist you. The above lists are not finite and there are other behavioural symptoms that could well indicate an addiction, such as stealing money from loved ones, committing a crime and blatant risk taking. Finding paraphernalia associated with abusing laughing gas, is a sure sign of it being used. If you are worried that a family member or loved one has a problem with abusing laughing gas or any other volatile substance, such as glue, petrol or butane gas, please do call and speak one of our friendly addiction experts about more information on what help is available in your local area. Laughing Gas Paraphernalia: What to Look For? If your family member or loved one is using laughing gas, you may find paraphernalia in the form of balloons, canisters, bullet-shaped gas containers (referred to as whip chargers), gas or cream dispensers and in some cases, heavy abusers will even invest in a medical mask and tube. Whipped cream cans are also often abused for the gas inside. The top part of the can contains nitrous oxide and the liquid cream underneath; once shaken the liquid cream is oxidised and will come out already whipped. Before it is shaken the Nitrous Oxide can be inhaled directly from the can. Finding many cans without a valid explanation is a sure sign of abuse or addiction. We understand that the discovery of laughing gas paraphernalia will be very frightening; the thought that your loved one may well have an abuse or addiction problem that is putting their lives at risk will naturally strike fear into every fibre of your being. We urge you not to shy away from speaking to them about this matter; as if their problem is serious, they may well need professional intervention and treatment. Please remember that you do not need to deal with this matter alone and that we are here to answer your questions and provide support 24/7. If you have found evidence to suggest that a loved one or family member is abusing Nitrous Oxide, it is important to speak to them and not just hope that it is a phase. Nitrous Oxide, when abused can kill. In most cases, it is usually a phase of experimentation, but with some, it can be a full-on addiction. If they insist on carrying on with their use and see it as harmless fun, there are measures they can take to help safeguard themselves against harm, but even taking these measures is no guarantee that harm will not befall them due to the nature and unpredictability of volatile gases. On speaking to them about your concerns, they may well brush off being challenged, especially if they are not ready to give it up. They may also justify their use, saying it’s safer than alcohol or other drugs and that all their friends do it. Urging them to read this page may well help them to see that it is not harmless and that there is support and help available if they have a problem. Recovery from addiction takes time, it is a continual and ongoing process of learning, change and growth. As a family member or loved one of someone who is addicted, it is vital that you too rebuild your own life in order to find happiness and peace of mind, regardless of whether your loved one is in recovery or active addiction. Many family members, through love, give their addicted loved ones too much support or provide them with the wrong kind of support. You cannot wrap them in cotton wool or save them from addiction; specialist treatment and help are required to overcome any addiction. The fact that they have an addiction is not yours or their fault. It is natural to want to help your loved one to get well, but it is best to seek advice and support before doing so. No doubt you will have spent many sleepless nights waiting to hear if your loved one is safe that night; you may have paid off debts on their behalf or given them money. It’s not unusual for family members to cover up on behalf of their loved one to save them from facing negative consequences. It is a natural instinct to want to protect them from harm. The problem with addiction is that it will take advantage of any protection given, in that it will be enabled to continue. Whilst there is still a safety net, very few with addiction will surrender to the correct professional help; all the while you will be suffering more pain and misery as a result. If you are to become free from the constant fear, anger, blame, shame and guilt that accompanies addiction, you too will need help and support to reclaim your life. Support groups such as Adfam and Families Anonymous are very helpful and supportive. You can also access counselling from your local NHS services through your GP. If your loved one or family member is attending a rehab programme, many rehabs also offer a family recovery programme or family support as part of their service. We encourage you to take full advantage of any help available so that you too can become free to live your own life once again. Complete abstinence is the first step in recovery from any addiction. If your family member confesses that they cannot stop using laughing gas, or that they have tried but failed, it is highly likely they will need professional treatment and are suffering from an addiction to it. Once an addiction has developed, it is unlikely that they will find recovery without life-saving specialist treatment. If on presenting the evidence you have found, along with examples of their behaviours, they still deny there is a problem, there is little that you can do for them until they are ready. We suggest at this point that you make sure you are not enabling their addiction in any way, through funding it inadvertently or covering up for them. For an individual with an addiction to want to stop and be willing to accept help, the pain of their consequences must be felt. We understand that this is incredibly difficult to watch with someone you love and care for, but it only by your loved one feeling the consequences of their addiction, that they may become willing to accept help in finding a solution to assist their recovery. If they do admit that they have a problem and want help, there are various treatment and support options available. Do you need help with a laughing gas addiction? Do you feel you’re no longer in control of your use? Has your use progressed from recreational use to a frequent necessity? Then you may well need professional help to stop. Sadly there is no quick fix to addiction, and many die as a result. It is important that if you have a problem beyond your control that you receive the correct treatment methods to help you get and stay well. The type and intensity of treatment that is most likely to work for you, will depend on a number of factors that are all vital considerations. By contacting addiction professionals such as ourselves, an individualised treatment plan can be advised of, taking into account all relevant personal factors. This will include how long you have been abusing the gas and how much you take, your age, current mental, social and physical health, any past physical or mental health history, any relevant risk factors, as well as any existing co-occurring illness or other addictions present. With this information, you can then be correctly advised as to the best course of treatment appropriate for your individual needs. If you are abusing laughing gas socially, but are able to stop and not use alone, then local free NHS services and counselling are usually a sufficient intervention. You can self-refer or ask your GP to refer you to your local DAT (Drug and Alcohol Team) if you are 18 or over. There are also many 12 Step fellowships that are free to access through meetings, we would suggest Narcotics Anonymous for this particular substance problem. If you are under 18 then you will need to speak to your GP about what services are in place locally to help you. SMART recovery also offers meetings and assistance for teenagers in many areas of the UK. If you are frequently abusing laughing gas (any use of Nitrous Oxide for purposes other than the industrial use or medical use is considered abuse), find you cannot stop, are using regularly, using alone, or feel your use is out of control, then you will need to consider more intensive professional help. That being the case, we suggest a period of time at a residential rehab. There, you will be in a supportive abstinence-based environment, whilst undergoing specialist addiction treatment to help you make a full and lasting recovery. If you are under 18 and want to be admitted to a rehab, your parents will need to agree to your admission. There are a couple of private rehabs available in the UK, that are fully Care Quality Commission regulated and will treat teenagers from the age of 16 upwards. We can also help by providing a locally qualified counsellor experienced in treating teenagers with addiction. If this is something you and your family are interested in, please call us for more information. Whilst there is no official medical detox for Nitrous Oxide addiction, it is recognised that a tolerance can be built to its effects. This means that the individual will need to take more and more in order to get the same effects. Over time the brain will adjust to the amounts inhaled and no longer give the individual the high that they seek – unless they take more. There is no evidence to suggest that stopping laughing gas when you are addicted will produce any withdrawal effects, other than an intense craving to take the gas. You may feel anxious for a period of time, as you battle with the cravings, but this should quickly subside with a period of complete abstinence. If you admit to a detox or rehab unit, and you do develop any unpleasant withdrawal effects from stopping the gas, the resident Doctor may prescribe a short course of medication to assist you through the initial period of complete abstinence. This will help you to remain in the rehab and complete the treatment, ensuring you the best chance of successfully overcoming your problem and remaining drug-free on returning back home. 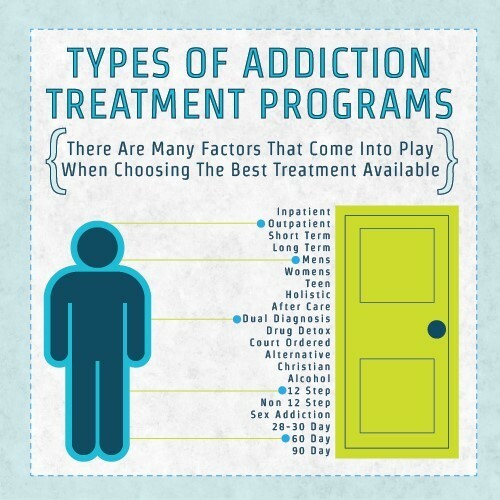 As with any addiction, if the individual has lost control over their using and is unable to get, or stay abstinent in the community, rehab is considered the most successful and comprehensive form of addiction treatment available. Some substances are pretty harmless when done in moderation and with caution, but with addiction things quickly spiral out of control. Abuse of any volatile substance is highly risky and should be avoided completely. When an addiction to a volatile substance such as laughing gas has developed, the sufferer loses the choice of whether to take it or leave it. The brain re-programmes itself to seek out the drug that stimulates the reward and pleasure system, no matter what the cost to the individual sufferer or to others. Addiction leads to a web of secrecy, lies, deceit, manipulation and degradation. The sufferer often ends up alone with only their addiction for the company, having driven all that love and trusted them away. Laughing gas is no different to any other volatile substance, drug or behaviour; if you have an addiction, you will be compelled to do things you would not normally do in order to get your next fix, even if means hurting yourself or those you love the most. Rehab for volatile substances, provides a protective and healing environment which is conducive to complete abstinence. With the temptation of access to any drug removed, and your behaviours closely monitored, you will be free to concentrate on your recovery and benefit from the numerous proven addiction treatment therapies on offer. Choosing an inpatient rehab for an addiction to laughing gas will offer you many benefits that the NHS and community services are unable to match. As well have to have a safe place to detox and stay abstinent whilst the cravings pass, you will also undergo a number of proven and highly effective specialist addiction treatment therapies. Therapeutic intervention is paramount to overcoming an addiction to laughing gas; stopping the substance will not be enough on its own and there will be at very high risk of relapse. It is essential to address the thinking and deep-rooted causes of the addiction if there is to be any hope of a full and permanent recovery. The brain will need to learn new and healthier ways of coping with life and emotions without the use of laughing gas. If this does not happen, as all that will have been achieved is a short period of abstinence. If you have an addiction to laughing gas, we understand that inpatient treatment may be a frightening prospect, but we can assure you that the vast majority that admits to a rehab enjoy their experience and benefit hugely from the experience. Furthermore, your family will also be supported throughout your stay and you can choose between short-term programmes and long-term programmes, including secondary and tertiary/sober living care. Many patients suffering from addiction find long-term programmes particularly beneficial as it helps them to reintegrate, with support, back into society. Inpatient or residential treatment means that all your needs will be met physically, mentally, emotionally and socially. This will include a well balanced nutritious diet, medication, specialist addiction treatments delivered by qualified professionals, a structured and safe environment, additional support where needed, social activities in-house and supervised excursions, family visits, phone calls to loved ones, and referrals to outside agencies as part of your discharge plan. 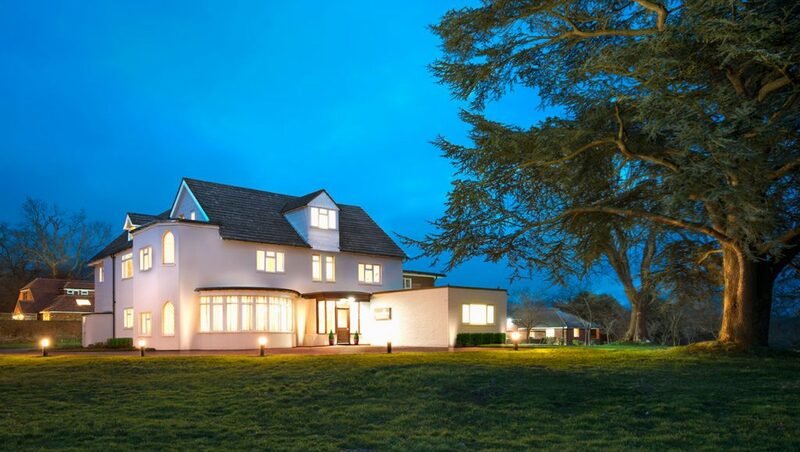 You will also be able to choose from a vast number of affordable rehabs, right up to the most luxurious and prestigious rehabs in the UK and overseas, with a number of flexible treatment programmes available. Deciding on the right rehab for you can be very stressful and confusing, especially when you are not sure what it is you need in terms of treatment. We can assist you with this, saving you the time and stress of researching many different rehabs and what they have to offer. It is not something you have to do alone, or without support and guidance. Addiction Helper work with over 100 Care Quality Commissioned rehab centres and detox clinics in the UK and overseas. Please contact us today for immediate admission, or to secure a position at the rehab of your choice with our expert guidance. Our rehabs offer the latest in proven addiction treatments and are stringently regulated, providing peace of mind. They are renown for their excellent standards of care and success. We will match the perfect rehab and treatment programme to your individual requirements, following a free, comprehensive assessment of your needs. Furthermore, will take care all of the arrangements to ease your stress. We are passionate about saving lives and will go that extra mile to ensure every aspect of your treatment is covered. With our help, you can break free from laughing gas addiction. Permanent recovery is possible and we can get you the urgent help you need to start your journey to freedom today.